Line sheet pan with foil, set aside. Rinse potatoes and place in microwave on high for 3 minutes. Remove potatoes from microwave and let cool for 5 minutes. With a spoon, scoop out the center of each potato to make a boat. 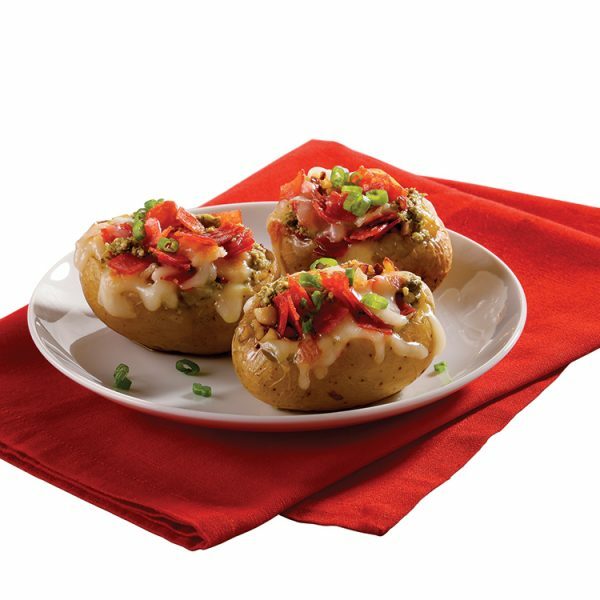 Fill each potato boat by evenly stuffing minced garlic, pesto, cheese, and pepperoni. Place potato skins on a sheet pan and bake for 10 minutes, or until cheese is bubbly. Remove skins from oven and let cool before serving.